- The AUD is still expensive and will fall further in 2019 says ANZ. - As valuations and global factors dominate currency markets again. - AUD/USD set to fall 3% before year-end as Pound-to-Aussie rises. The Australian Dollar is still expensive on a fundamental basis and is likely to underperform many other currencies again next year, according to analysts at Australia & New Zealand Banking Group (ANZ). A challenging global environment will conspire with a series of domestic headwinds to weigh on the Antipodean currency in 2019 just as it has done in 2018, the bank says in its year-ahead outlook, as investors focus on valuations in an environment likely to be driven by big picture macroeconomic themes. "2019 looks like it has the potential to make 2018 look like it was straight forward. The global growth trend will slow, policy inertia and tighter credit will intensify the weakness in liquidity and geopolitics will remain at the forefront. This will make for an inherently volatile and thematically unstable environment," says Daniel Been, head of FX research at ANZ. Above: Antipodean sensitivity to global growth. Source: ANZ. The current year has seen the Australian Dollar buffeted first by a deterioration of the outlook for domestic interest rates, which weighed on the currency as other central banks around the world signalled they would look to lift theirs. Then domestic lenders began lifting mortgage rates to offset the impact of increased wholesale funding costs. Those have risen due to the interest rate policy of the Federal Reserve, which made U.S. Dollars more expensive. And more recently, President Trump's so-called trade war with China has destabilised markets and hurt currencies that are either sensitive to changes in the Chinese economic outlook, or developments in investor risk appetite. "Global dynamics remain in the driver’s seat, and although there has been some respite in risk sentiment of late, risks have not disappeared. For trade tension, the can has only been kicked down the road," Been writes. All of the above factors have led to a decline in the "fair value" of the Australian Dollar which, despite 2018 losses that reached 10% at one point, has not fallen fast enough to prevent itself from becoming overvalued. 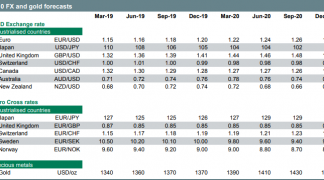 Been says 2019 will be a year where 'overshoots' of fair value drive market performance rather than changes in individual currency fundamentals. He also notes how emerging market currencies have gone from overvalued to undervalued and suggests the Aussie needs to complete the same cycle before it can stage a sustainable turnaround. "The AUD and NZD are, on our measures, both still somewhat expensive. It would be almost unprecedented for weakness in either to stall at fair value, rather than end with an overshoot," he writes. 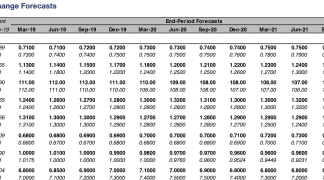 Been forecasts the AUD/USD rate will end this year back at 0.70, implying a 3% is likely over coming weeks, and that it will then fall as low as 0.67 before June 2019 only to then return to 0.70 in time for year-end. The Pound-to-Australian-Dollar rate is projected to rise back to 1.80 in time for the end of 2018 although it is seen declining to 1.78 before the end of next year. 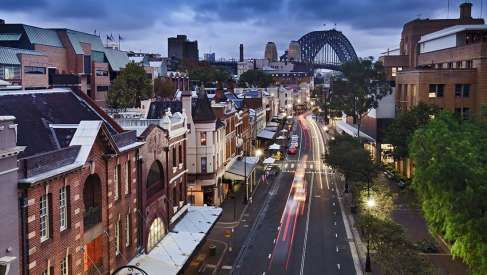 The AUD/USD rate was quoted -0.64% lower at 0.7222 Thursday, marking the third consecutive London trading day that has seen the Aussie decline by more than 0.5%, after retreating rapidly from a four-month high of 0.7390 on Tuesday. The Pound-to-Australian-Dollar rate was up 0.78% at 1.7651 and has now gained 2.4% for 2018 after rising off a four-month low in the Tuesday session. Thursday's price action comes after duo of disappointing economic numbers hit the wires in Australia and as the market frets about perceived threats to the 'trade war' detente between the U.S. and China, which is less than a week old. Australia's trade surplus fell to $2.32 billion in October, down from $2.94 billion previously, when markets had looked for an increase to $3.1 billion. The decline is the result of imports having risen faster than exports during the month, with the value of goods coming into the country rising by 3.2% as exports grew only by 1.3%. "For the trade sector, it’s a lacklustre start to the fourth quarter," says Andrew Hanlan, an economist at Westpac. "The net exports picture – the month of October was most likely a negative one, with the jump in imports dominating." 'Net trade' already made a disappointing contribution to Australian GDP growth in the third quarter, although Hanlan's assessment of Thursday's figures suggests it could easily do the same again in the final quarter. Retail sales rose at a healthy clip of 0.3% in October, according to data released Thursday, and were in line with expectations. But September's growth number was revised downward by 10 basis points, adding further to the negative tone of recent data emerging from Australia. 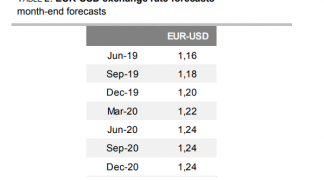 "Our AU economists say this highlights a key theme/dichotomy in yesterday’s Q3 GDP which continued in Q4 and will likely remain in 2019 – easing domestic demand in contrast to a stronger external sector," says Elsa Lignos, head of FX strategy at RBC Capital Markets.